“We would like to say a huge thank you to staff at Nationwide’s Wales and the Borders branches, whose fantastic fundraising efforts led to a wonderful £2,014 donation for Welsh Women’s Aid. Violence against women is experienced by one in three women in Wales, and unlike other violent crime, levels of violence against women are sadly increasing. Highlighting the extent of continued issues of violence against women, domestic abuse and sexual violence across Wales is a key part of what we do. This vital awareness raising work is so important in getting the message out that violence against women – or indeed anyone – should not be tolerated, and that support is available. 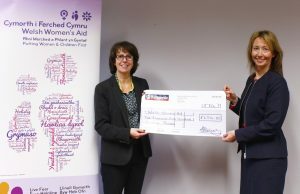 “Nationwide Building Society, Wales and Borders Area, were delighted to support Welsh Women’s Aid in January raising funds and awareness within our branches for a wonderful charity who are working to end domestic abuse and all forms of violence against women. Our teams came together baking cakes, sponsored cycle rides, holding raffles and engaging with our Members whose generosity helped raise a fantastic £2014.